Mintonye Elementary School is located in a rural setting ten miles southwest of Lafayette and is on the same campus as Southwestern Middle School. Constructed in 1967, the Mintonye building received an expansion and renovation project completed in 1993. The building continues to be upgraded with improvements on an annual basis, rivaling newly built facilities. The community is proud of the outstanding condition of the facilities in the TSC. Mintonye serves approximately 500 students in preschool through grade five. The average class size is 24 students. Greater Lafayette Area Special Services has a program for K-5 students with severe disabilities located at Mintonye, as well as a special education preschool class. The name Mintonye /Min-tawny/ comes from the Mintonye family, owners of the land where the original Mintonye school once sat. 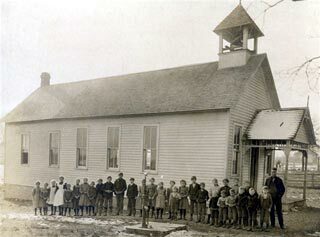 The original Mintonye school was a one room school house east of the current school property. The Mintonye Cemetary lies near the original school site. The original school operated from 1860-1909. From 1909-1967, there was no Mintonye school. The current Mintonye building was constructed and dedicated in 1967. WIDA for English Language Learners. The teachers of Mintonye Elementary School utilize the proven, research-based framework of direct instruction when planning lessons. Planning begins with an objective aligned with the Indiana Academic Standards. Objectives are posted in classrooms daily. Lessons contain the necessary components of direct instruction in an effective sequence. Within this framework, teachers use effective instructional strategies such as hands-on activities, visual supports, cooperative learning groups, technology, differentiated instruction, note-taking, and nonlinguistic representations to engage students in learning. Teachers also incorporate strategies from Lemov’s book, “Teach Like A Champion”. Students are encouraged to be active participants in discussions and activities during lessons. Mintonye teachers use the WriteSteps Writing curriculum which is aligned with the Indiana Academic Standards. Rubrics are used to assist teachers in the assessment of student composition. Based on the standards, the writing rubric lets students and parents know which writing skills are strengths and which are concerns. The rubric may also serve as a motivator for students wanting to advance to higher levels on the rubric. Further, the rubric assists teachers in making sound instructional decisions for the class or individual students. Each grade level team of Mintonye teachers has created an Annual Plan for Reading, Language Arts, and Math. The Annual Plans outline how the curriculum will unfold each month of the school year. This assists the teachers in pacing themselves, ensuring that they teach the Indiana Academic Standards within the school year. Programs that have been implemented in recent years to bolster instruction as well as provide tier 2 and tier 3 interventions include Houghton Mifflin Journeys Reading, Michael Heggerty Phonemic Awareness, Zoo Phonics, Mountain Math, Mountain Language, Read Naturally, Leveled Literacy Intervention, IXL, Accelerated Reader, WriteSteps Writing, and Ready Math. The achievement of students at Mintonye Elementary is a source of pride for the school and community. Mintonye’s ISTEP+ passing percentages have consistently exceeded the state average. Mintonye has also received the I.D.O.E.’s Four Star School Award seven times. 100% of our third grade students passed the IREAD3 in 2012 and 2015, and 99% passed IREAD3 in 2013, 2014, 2016, and 2017. At over 96% annually, our attendance rate has been consistently above the state average. Results from the spring 2017 ISTEP indicate that Mintonye’s third and fourth grade students were strongest in English Language Arts, while fifth graders were strongest in Math. Third grade and fourth grade students were slightly weaker in Mathematical Process than other skill areas tested in math. Fifth grade students were slightly weaker in Writing Conventions of Standard English than the other skill areas tested in English Language Arts. Spring 2016 ISTEP+ Growth Model data is satisfactory. In English Language Arts, 78% of fourth grade students, and 54% of fifth grade students achieved High or Typical Growth. In Math, 69% of fourth grade students, and 60% of fifth grade students achieved High or Typical Growth. Fifth grade growth in English Language Arts was the weakest growth area and is an area of needed improvement. Data derived from the 2017 End-of-Year administration of mCLASS Reading 3D TRC assessment reports 72% of kindergarten students were Proficient or Above Proficient, 54% of first grade students were Proficient or Above Proficient, and 91% of second grade students were Proficient or Above Proficient. Second grade met the expected minimum percentage of 80% at benchmark. For students not meeting benchmark, teachers review the individual student data and implement interventions to address concerns. Reading achievement in kindergarten and first grade is an area of needed improvement. The 2016-17 school year marked TSC’s first year of assessment using NWEA. The end-of-year assessment results reported that first through fifth grades scored higher than the National Mean Score in Reading and Math. Kindergarten scored 0.4 points lower than the National Mean Score in Reading, and 4.4 points lower that the National Mean Score in Math. Kindergarten teachers will review student performance data to identify any curricular weaknesses and bolster instruction in those areas. Reading and Math achievement in kindergarten is an area of needed improvement. Mintonye Elementary School enjoys strong parental support and participation, which is an important factor in the school’s success. The frequent communication between the teachers and parents has built a strong foundation for the students’ achievement and behavior. Attendance at Parent-Teacher Conferences averages over 98%. The Mintonye PTO provides an array of school and community services, and provides financial assistance for several school projects. The Parent Volunteer program is quite active and provides much support for teachers and students. Parent volunteers assist teachers in the classroom and in our tutoring program. Our specialty areas teachers also have parent volunteers who assist them, and each grade level has parent volunteers who serve as parent representatives at PTO meetings. At any time, on any day, volunteers can be found assisting at Mintonye. Mintonye also has the All Pro Dads program, which holds monthly breakfast meetings for students and their fathers. We also participate in Read To Succeed, which brings community volunteers into the building to work on reading skills with the children. The TSC will be expanding its 1:1 initiative for the 16-17 school year to include each of its six middle schools. Plans are currently underway to identify the most suitable technology option for intermediate students at the elementary level. Once this determination has been made, the goal is to deploy classroom sets of devices at these grade levels. Stakeholder Collaboration: A great deal of collaboration takes place between curriculum leaders, technology staff, principals, and teachers at each stage of technology deployment. Both instructional and tangible goals (e.g. what do we want the students to do with the technology?) are taken into consideration, as well as a host of other factors. Before a large-scale implementation, we typically utilize a pilot group to gather input, identify professional development needs, and assess the overall scalability of the project. Mintonye Elementary makes every effort to provide an inclusive environment by meeting the needs of all students. Serving a small population of students from different cultural backgrounds as well as students with all types of disabilities, the staff at Mintonye has received professional development that has prepared them for understanding the needs of varied populations. As the population of the school will likely continue to evolve, the staff is comfortable with further professional development that may be required to equip them with the tools necessary to meet the needs of new populations. Professional development activities are ongoing with our daily Instructional Improvement Block before school (8:15 a.m. to 8:45 a.m.). Examples of how this time is used include: training and follow-up of new initiatives, assessment data review to identify areas of needed improvement, grade level planning to maintain curricular cohesion, and training in new hardware and software. The most recent professional development activities in which Mintonye teachers have participated include implementation of NWEA, Ready Math, IXL, Reading Eggs, Google Classroom, WriteSteps Writing program, Indiana Academic Standards, Houghton Mifflin Journeys Reading series, Leveled Literacy Intervention, Bullying Legislation, STAR Enterprise, Google Apps, and Student De-escalation. The PD360 video series has also been used to provide professional development on topics such as Brain Research and the Common Core State Standards. Additionally, professional development opportunities are provided by the school district after school and during the summer. Professional reading is generally in the form of electronically sharing articles concerning educational issues and initiatives, and faculty book studies. Due to funding deficiencies, it has become increasingly difficult to provide professional development opportunities outside the school corporation. If your family is planning to be away from school due to a scheduled family educational trip, please fill out the following form.